The Pakistan - China friendship dates back to 21 May 1051 when Pakistan became one of the first group of countries to recognize China as an independent state. Since then, China and Pakistan have witnessed smooth development of friendly and neighbourly relations as well as mutually beneficial cooperation. These sixty years between 1951-2011 have shown the resolve between the two great countries to cement their ties more stronger every day that passes by. The hallmark visit of President Ayub Khan to China in December 1964 opened a new era of friendship and long term partnership between the two countries. 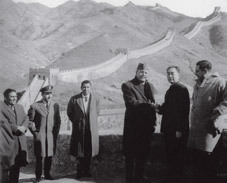 President Ayub was so warmly received by the Chinese that people still remember that warmth even today. China today is the major trade partner and contributor of defence equipment to Pakistan. The recent joint venture of JF-17 Thunder multi-role jet aircraft has further cemented the ties between the two countries. Commemorating the 60 years of long and tested friendship, the State Bank of Pakistan has issued a Rs.20 commemorative coin (above top) with effect from 21 May 2011 to celebrate year 2011 as the Pakistan-China friendship year. The coin has a diameter of 30 mm and weigh 9.5 grams. The obverse of the coin shows the waxing crescent and a five-pointed star facing northwest in rising position. The words - 2011, YEAR OF PAK CHINA FRIENDSHIP - in English is written on the top of coin.